Updated F.A.Q Page – How to add sources to Cydia. Well, after a long night of travel last night, we reached our destination. So today, with a little bit of down time before all the Christmas craziness begins, I have updated another guide on our f.a.q page. It is a detailed guide on how to add sources to Cydia. This includes step-by-step instructions on how to install additional sources using Cydia and how to manually add your own sources to Cydia. You can check out the How to Add Sources to Cydia guide HERE. If you are looking for more source…check out our Sources Page. 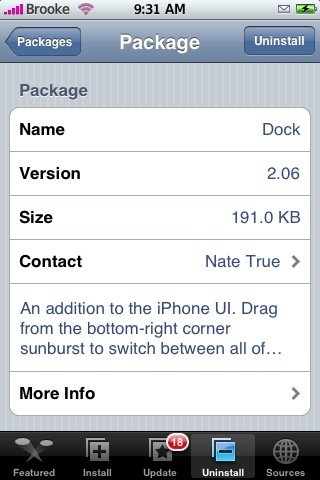 It contains a list of sources available for both Cydia and Installer. F.A.Q Page – How to Install an Application using Cydia. A lot of apps or addons to apps use the root folder instead of the mobile folder. When running 1.1.3 this is annoying when installing a theme, eBook, etc. Ok…I just got this error in my Installer – “main script execution failed!” I tried restarting my iPhone, installing different apps (both new and updates) and even installing apps from different sources…no luck, still got the error. That is when, in frustration, I handed my iPhone to Doug and being as brilliant as he is…he fixed it! All I needed to do was clear my queue! I had tried to install weTool-US…which got almost through the install process and gave me the “main script execution failed!” error (which I still get when I try to install this app). Well, from there, I tried to install other apps not realizing that weTool-US was still in my queue. So, moral of the story, try clearing your queue (or hand your iPhone to someone brilliant)! We have had a lot of questions on how to remove/reverse BossTool. I personally have never done this and must warn you that it is a little tricky and definately done “At Your Own Risk” but, if you would like to give it a shot, below are some instructions I found on ipodtouchfans.com via ali.bigolo. You will first want to uninstall all your applications just to be safe because, the OS partition is smaller and it is safer to have only necessary stuff there. 1. Back up your Application folder. You can do this by OpenSSHing into your iPhone and dragging the root/private/var/Applications folder from your iPhone to your Desktop…select Copy. Below are instruction on how to manually change the dialer on your iPhone. The “dialer” is the keypad used to dial a phone number when in your Phone. If you are on firmware 2.x – When you jailbreak your iPhone/iPod Touch, the Cydia application will be added to your SpringBoard with the rest of your applications. You will want to go into Cydia and search for the OpenSSH application. If it is not already installed, you will need to install it. If you are on firmware 1.1.4 or below – you will need to use the installer.app and install both BSD Subsystem and OpenSSH on your iPhone (in that order). If you are on a PC…you will then need to install WinSCP on your computer. Macs come with OpenSSH but if you’d like some alternatives check here. To connect to WinSCP you will need to go into your Settings application on your iPhone and then into the Wi-fi option, click on the little arrow next to the Wi-Fi you are connected to and get the ip address. Now open WinSCP on your computer….the Host Name is your ip address (with the periods) the user name is root and the password is alpine. Don’t worry about the Private key file, you don’t need to put anything there. Hit login.